Looking for a New Audi S5 Sportback in your area? CarGurus has 308 nationwide Audi S5 Sportback dealers with 1,682 new car listings. After debuting last year, the S5 Sportback carries over with few changes for 2019. There was no need to change the S5 Sportback exterior for 2019 because Audi nailed it the first time. The elegant shape flows smoothly from an aggressive front end to a tapered roofline and all the way back to a steeply raked hatchback. The S5 Sportback separates itself from the A5 Sportback with unique styling elements like a Platinum Gray grille with matching aluminum-optic side mirror housings, an S-model rear diffuser with a honeycomb structure, and chrome-tipped quad exhausts. Eighteen-inch wheels with summer performance tires come standard, with 19-inch wheels available. The oversized grille, low stance, and muscular shoulder line of the S5 Sportback speak to the power lurking under the hood. That's where you'll find a turbocharged 3.0-liter V6 that produces 349 horsepower and 369 lb-ft of torque and is mated to an 8-speed automatic transmission. It pushes the 5-door hatchback from 0-60 mph in 4.5 seconds. Audi’s quattro all-wheel drive (AWD) comes standard and features a self-locking center differential and wheel-selective torque control for optimal handling. Audi's drive select also gives you a choice between Comfort, Auto, Dynamic, and Individual modes, adjusting the steering, shift points, damper control, and the available adaptive cruise control. To further enhance your ride, check out the S Sport package that adds sport adaptive damping suspension, a rear sport differential, and some stylish red brake calipers. On top of all that sporty styling and power, the S5 Sportback also offers convenient cargo room. There’s 21.8 cubic feet of cargo space behind the second row of seats and 35 cubic feet available with those rear seats folded. The cabin is made with high-quality materials that have been crafted together with a precise finish. There’s also plenty of comfort features like heated front seats with side bolsters and massage function, Leather/Alcantara seating surfaces, 3-zone climate controls with a rear digital display, a power sunroof, and ambient LED-interior lighting. There’s also plenty of standard technology, like Bluetooth; Apple CarPlay; Android Auto; a voice control system; a 10-speaker sound system; and keyless start, stop and entry. The 7-inch color driver information system and 7-inch MMI infotainment display are easy to use and have great graphics, but they can’t be paired with a navigation system. For that you have to go for the Prestige trim or add the Navigation package to the Premium Plus trim. That package come with an 8.3-inch infotainment display. Other noteworthy technology options are head-up display (HUD), virtual cockpit display cluster, Bang & Olufsen 3D sound system, and MMI touch with handwriting recognition. 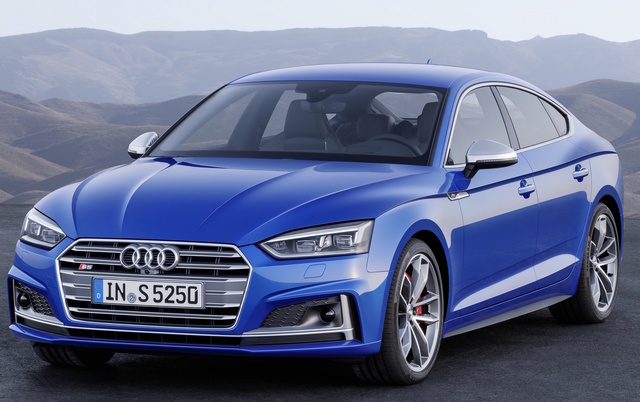 Standard safety features for the S5 Sportback include antilock brakes, electronic stability control, a tire-pressure monitor, a vehicle immobilizer, and a full complement of airbags. Standard driver-assist technologies include features that close all the windows and tightens safety belts when anticipating a collision and automatic braking when it detects pedestrians and other vehicles when you are driving under 52 mph. There is an updated Convenience package that now includes blind-spot monitoring, while park assist now comes standard on the Prestige trim. The available Black optic package has also been updated with 20-inch Audi Sport 5-arm-rotor design wheels with titanium matte finish and summer performance tires. The National Highway and Traffic Safety Administration (NHTSA) and Insurance Institute for Highway Safety (IIHS) haven't yet rated the S5 Sportback. The S5 Sportback offers a sportier version of Audi's A5 Sportback, while also including plenty of safety and luxury features. What's your take on the 2019 Audi S5 Sportback? GuruBH9VH does it fit my price range? Have you driven a 2019 Audi S5 Sportback? Enter your zip to see incentives for a new S5 Sportback in your area. CarGurus has 647 nationwide S5 Sportback listings starting at $45,988. When will the 2019 Audi S5 Sportback be available for purchase?